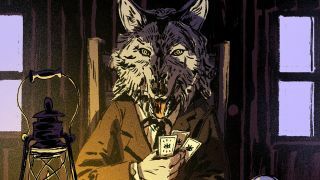 Where the Water Tastes Like Wine is a game with ambition matched only by the tongue twisting required to say its title. Not much about its gameplay has been revealed, but a new trailer should give you a sense of what the game is aiming for, as well as who will be voicing the characters you'll come across during your journey. You may recognize some of these names from other games; Elizabeth Maxwell just recently played the role of Lady Urbosa in Legend of Zelda: Breath of the Wild, Melissa Hutchison and Dave Fennoy have both had major roles in Telltale's The Walking Dead (she as Clementine, he as Lee), Kimberly Brooks voices Ashley Williams in the Mass Effect series, and Cissy Jones played Delilah in Firewatch. But the biggest name has to be Sting. No, not the Crow-looking guy. The frontman for English new wave band The Police. You know, the group behind hits like "Don't Stand So Close To Me," "Roxanne," and of course, "Every Breath You Take". He'll be voicing a character simply known as "The Wolf," who is, yes, literally a wolf.